Paper hand cut of two yellow and red birds that are perched on a flowering vine. 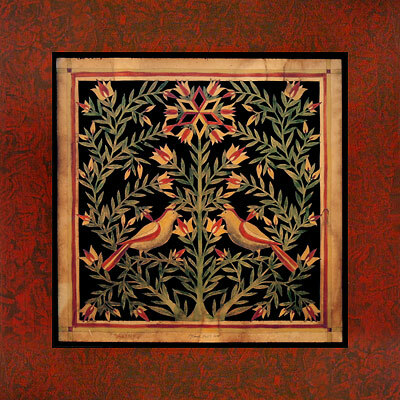 A six-sided geometric flowering design is the main focal point with the two birds resting at opposite views on the vine. Many small leaves and flowers are mixed into the scene. Signed and dated by P.J. Rankin Hults. This piece was featured in the "Early American Life" magazine at the Gunston Hall Mansion in Virginia.